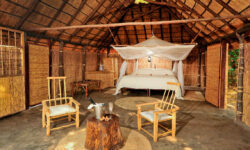 5 Double / twin Luwi Camp is nestled in the shade of huge mahogany trees, close to permanent hippo and croc filled lagoon. It is situated in the heart of the National Park on the Luwi River. This is the only camp in this area. 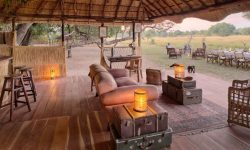 Luwi is an authentic and magical remote bush camp which makes it the perfect camp for walking safaris. The wildlife is prolific in the area and memories of the experience of tracking big game on foot last s lifetime. Walks can also be complemented by game drives where you can see the elusive Roan antelope or reed buck. 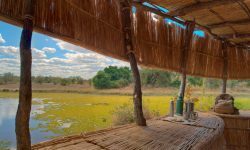 The rooms, which are built each season using natural materials, blend into the bush and are simple yet extremely comfortable with en-suite bathroom and all day hot showers. 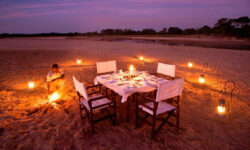 Meals during the day are served under the shade of the Mahogany trees and dinner under the stars along with the natural sounds of the Zambian night. Luwi is famous for its lions and the thrill of tracking them on foot. It is also great for wild dog sightings.